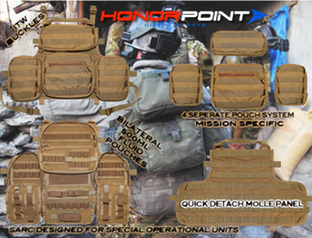 The BMP+ by HonorPoint-USA is a modular 4-pouch Medical system that has the ability to be mission configured. Four (4) individual pouches strap to a Molle panel that’s then attached to an armor carrier by way of ITW, side access, Quick Release Buckles. With the utilization of the ITW releases, this allows personnel to completely remove the unit as a whole and access it’s continents entirely for Casualty Care. The panel consists of multiple rows of molle webbing, a top mounted strap-handle, and several armor attachment points. Two (2) of the pouches are specifically sized to hold 500ml IV bags or other blood expander products. All of the pouches have interior elastic webbing of various sizes allowing complete customization of your layout. The upper pouch can accommodate a traction splint or other gear. The middle pouch is an excellent utility pouch for various products, i.e. airway management, wound treatment, vascular access, hemorrhage control, etc… There is also a slit cavity for holding 2 SAM splints located near the carry handle. Made of durable cordura with MilSpec stitching, heavy-duty zippers secure the units, and grommet drain holes are in each pouch. US Navy SARC (Special Amphibious Reconnaissance Corpsman)-MARSOC designed, built, and tested with Army Ranger Medics 18Deltas.